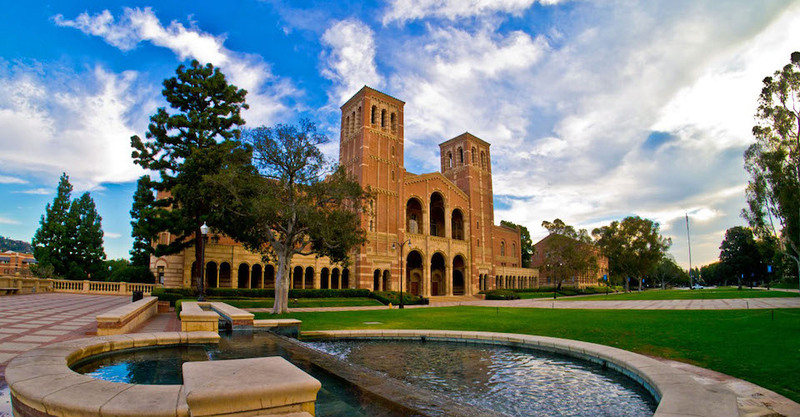 The University of California at Los Angeles (most commonly referred to as UCLA) is one of the most frequently searched universities in the United States, according to a recent internet keyword search of American colleges. The college is a public research university located in the Westwood neighborhood of Los Angeles. Founded about a hundred years ago in 1919, the university currently maintains an enrollment of roughly 45,000 students each semester. About two thirds of them are studying at the undergraduate level. The average undergraduate acceptance rate is currently around 17%, but the rate varies by school. The average student faculty ratio is 17 to 1. 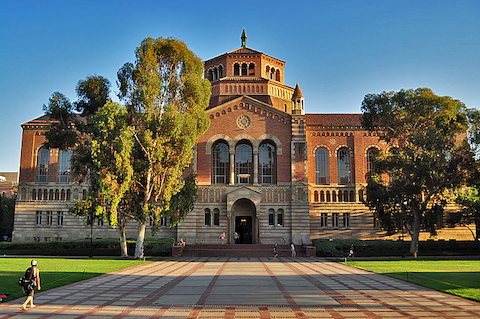 UCLA offers more than 130 undergraduate majors, as well as many graduate degrees and a number of PhD programs. Academically, UCLA was recently ranked 15th in the world (and 1st among public universities in America) on the Times Higher Education World University Rankings report. Notable graduates of UCLA include at least two dozen Nobel Laureates, no less than 10 Rhodes Scholars, 10 winners of the National Medal of Science, 3 Pulitzer Prize winners, many CEOs, a long line of noteworthy politicians, countless sports figures, and numerous award winning entertainers. Famous Alumni include actress Mayim Biyalik, Pulitzer Prize winning author Martin Sherwin, and actor Ben Stiller, among others. The university is accredited by the WASC Senior College and University Commission (WSCUC), which is the regional accrediting agency of colleges in California, Hawaii, and the Pacific region. 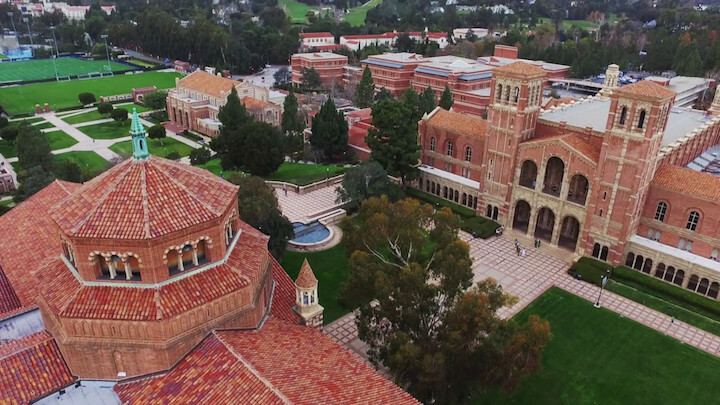 Shown above: Drone footage of the UC (Los Angeles) campus. Here are the answers to some frequently asked questions about the University of California, Los Angeles. The main campus is located in the Westwood Village section of Los Angeles, roughly 20 miles northwest of downtown L.A. Above: Royce Hall, the main architectural campus landmark. 2. What is the organizational structure of UCLA? The university also has nine professional schools, including a law school, and four schools of health sciences, including a medical school. 3. What undergraduate studies are offered at UCLA? Undergraduate course offerings here cover a wide range of topics. 4. What graduate programs are available at UCLA? For the longest time, UCLA was a well known film school. The school was teased a bit by other universities, because the only PhD program it offered was in Accounting. And this was arranged only so that UCLA could call itself a university, and become part of the UC system. Times have changed. Now UC Los Angeles has many PhD programs to choose from. Above: Hot campus babes rev up for summer fun! 4. What programs are available at the UCLA School of Law? The Bar Pass rate for graduates of the law school is about 88%. 6. How much does it cost to attend UCLA? Roughly $55,000 to $65,000 per year for enrollments from out of state. Graduate school tuition may vary by school and degree. $ 3,902 mandatory Health Insurance fee. In addition to annual tuition and fees, law school students should budget roughly $560.00 per semester for books and supplies. Other fees may also apply, such as application fees, registration fees, parking fees, technology fees, and others. Most undergraduate students do not pay the full cost of tuition. 7. What is the UCLA campus like? The main campus spans about 419 acres in the urban setting of one of America's best college towns. The campus contains at least 163 buildings, some of them constructed from imported Italian brick. Included in the architectural mix are more than a dozen housing complexes. 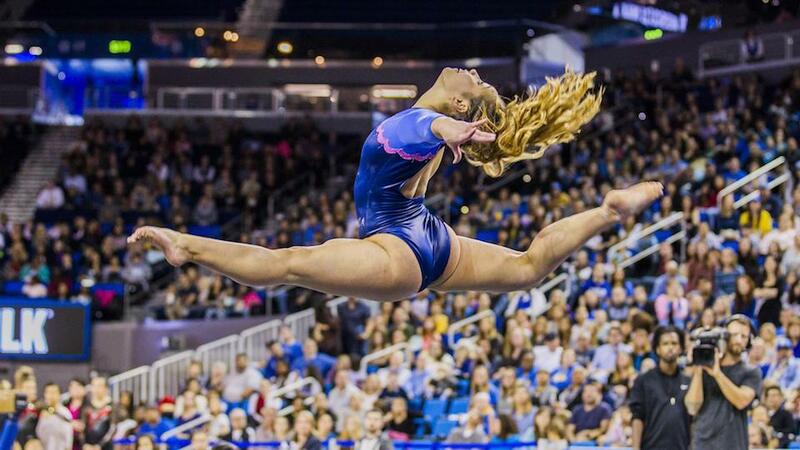 Campus landmarks and attractions include Royce Hall, the Powell Library, the Fowler Museum, and an indoor arena called the Pauley Pavilion, among others. The campus is also home to 12 libraries, containing a total of more than nine million books. The grounds are adorned with sculpture gardens, fountains, and a time-honored blend of architectural styles. Surrounding the campus is the charming Westwood district. Public transportation is readily available. Popular local entertainment venues include the Getty Center, the L.A. County Museum of Art, and the Walt Disney Concert Hall, among others. The school colors are blue and gold. The varsity athletes here are called the Bruins. They play for the NCAA Division 1 - Pac-12 Conference. Proudly, U.C.L.A. has won more national championships than any university except Stanford. Aside form athletics, the school also features more than a thousand on-campus undergraduate student organizations, spanning a wide range of interests. Student activity groups include an African Arts club, a Christian fellowship, a campus magazine, a cooking club, a karate club, a theater ensemble, a film society, and a Pre Law society, to name only a few. Above: The Bruins in action. Above: A member of the school's award-winning gymnastics team. 8. What are the distance learning options at UCLA? 9. 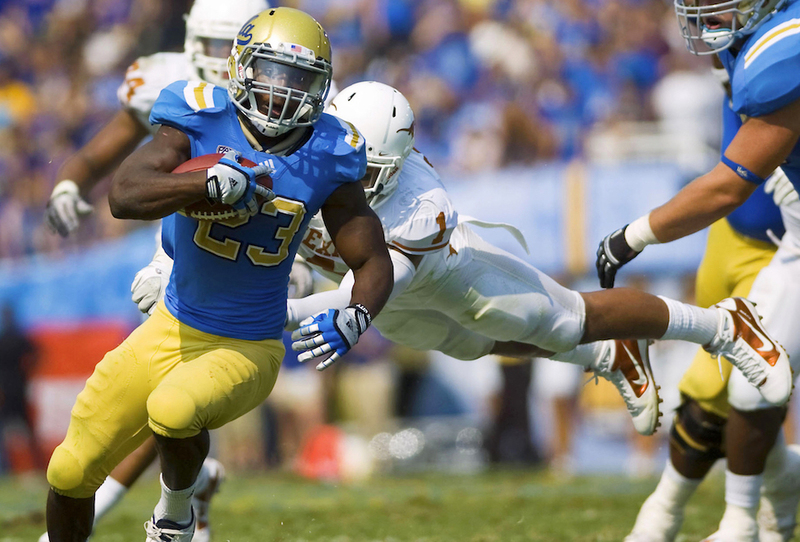 What is the contact information for UCLA? To reach the main campus, or for general information, call 310-825-4321. To reach the office of Undergraduate Admissions, call 310-825-3101. For the Graduate Admissions office, call 310-206-3411. To inquire about financial aid, call 310-206-0400. To contact the School of Law, call 310-825-4841.